The Rose Hill Restaurant began operations in January of 1957 by Donald and Ruth Buckner with a seating capacity of 46. The menu specialty was Pit-Cooked Barbecue Pork and Chicken with daily specials of Southern-Style, home cooked meals. In 1962, the Greenwood Room was added with 45 seats. In 1972, the Tarheel Room was opened with an additional 100 seats. Still in the 70’s, the Rosemary, Club, and Farmers Rooms were added. In 1994, the Balcony room was added. The total seating capacity of the restaurant is 250. 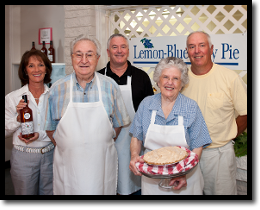 The Rose Hill Restaurant is still owned and operated by the Buckner Family, serving home cooked meals and our Lemon Blueberry Pie made famous by Ruth Buckner.